Chef Pekka Terävä is one of the greatest ambassadors of Finnish cuisine. His style is described pure and fresh and he likes to let the ingredients shine with their natural taste. He doesn’t follow ever changing food trends but likes to think cooking as a concept with many layers. It is a combination of the past, present and the future. The former professional soccer player started his culinary career at the legendary restaurant school of Suomen Joutsen in the early 1980’s, a school that actually located inside an old sail-ship in Turku, Southwest-Finland. Since then Chef Pekka Terävä has worked in various fine-dining restaurants in Finland and Sweden including Edsbacka Krog, G.W. Sundmans and Palace Klippan. He even spent a few years taking care of the culinary development at Silja Line, the biggest cruise line in the Baltic Sea. Chef Terävä has had great success in several international chef competitions both solo and as a member of the Finnish national team. He won the title of Chef of the Year in Finland in 1995, got Bronze in Chef of Scandinavia Competition in 1998, was the Winner of Hanstown Fish Competition in 1997. He joined the Finnish National Team of Young Chefs in 1995 where their team won the Bronze Medal at the Chefs World Cup in Salzburg in 1996 and Bronze at the Olympic Games in Berlin in 1997. He continued his National Culinary Team career over the next few years and their team won Gold in the World Cup in London in 1998. 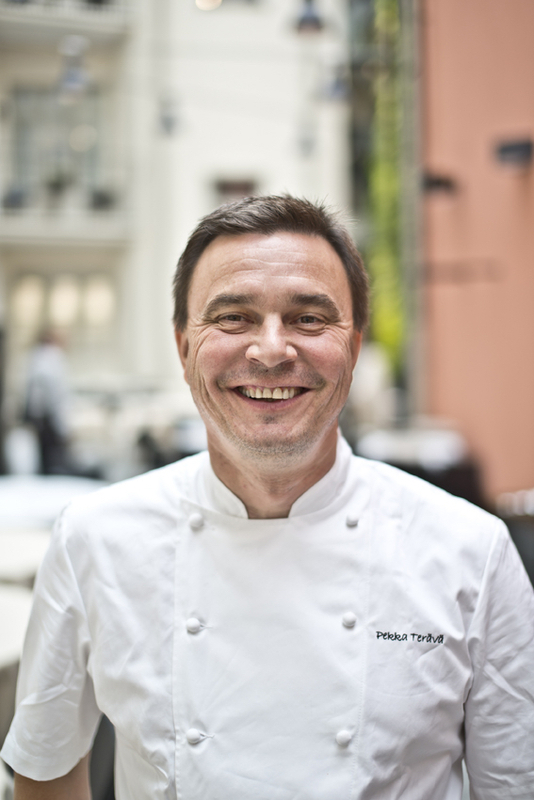 Chef Terävä was also awarded Chef of the Chefs in 2014 by his chef colleagues. Chef Pekka Terävä has also been active around the legendary Bocuse d’Or competition. He was the Coach of the Finnish team twice in 2008 and 2010 and has been the Member of the Bocuse d’Or Official Jury in and the President of Bocuse d’Or in Finland between 2011 and 2017. In 2006, he opened Restaurant Olo in Helsinki together with Petri Lukkarinen. The Helsinki based restaurant was chosen to be the best restaurant in Finland by the Association of Finnish Gastronomy in 2009 and rated with one Michelin Star in 2011. Olo has kept its Michelin star and high standard ever since. After the opening of Olo, Chef Terävä has been involved with two more restaurants: Helsinki based Gastrobar Emo and Restaurant Gösta, located in Serlachius art museum Gösta’s premises in Mänttä, Finland. Gastrobar Emo received a Bib Gourmand mention in the Nordic Michelin Guide only 6 months after its opening in 2013 and has kept the mention ever since. Nowaday Chef Terävä spends most of his time working with the newly founded start-up Food Camp Finland, that does consulting, events and catering. Another newcomer in Olo Group is BottleScouts, an online store for wine, in which Chef Terävä is strongly present as well.